New from Pacific Sensor Technologies, the BMRX range of rotary paddle level switches have been designed to provide security from system power failure, easy access to all components, and reliability through advanced circuitry. From Bin Master in the USA, rotary paddle level switch switches have few moving parts and feature a slow speed synchronous motor that rotates the paddle when the presence of material is sensed at the level where the BMRX is placed. The BMRX rotary paddle level switches rotate continually when material is absent. When material reaches the paddle, the resistance causes the motor to ‘de-energise’. This will automatically shut-off any process systems wired to the relay and the paddle will be stopped and the motor ‘de-energised’ when material is present. The motor will ‘energise’ when the material drops below the paddle and this will automatically start any process systems wired to the relay. Typical applications include feed, food process, mining, cement, grain, plastics, aggregates and wood products. 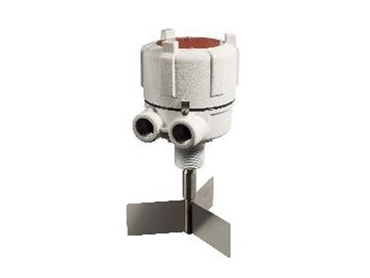 Rotary paddle level switches can be used in materials with a bulk density as low as 2 lb/ft³ (30 kg/m³). By managing material storage and flow with the BMRX, you prevent bin overflows, empty conditions, clogged chutes, and jammed conveyors. This eliminates unnecessary down time, costly spills and material waste.